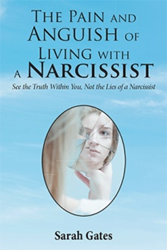 ‘The Pain and Anguish of Living with a Narcissist’ released. Sarah Gates shares her experiences from narcissistic abuse in the book, “The Pain and Anguish of Living with a Narcissist” (published by Xlibris). She tells the world her personal story as a way of fighting off the pain she has felt as a victim and to let out the truth of what a narcissist is and what harm they can do to someone. The book depicts the abuse in a personal setting, and provides hints on how to identify a narcissist and what pain they can inflict to people along with describing the feelings of being abused. All of these stemmed from the author’s own experiences on a daily basis. The chapter titles describe what signs to watch out for. “It’s time that I claim back my life and do what I was born to do and to stop being the narcissist’s puppet,” Gates declares. The author invites readers to decipher each word from the book, in hopes that it will help them become more aware and how to take notice of any narcissistic abuse, and learn how to get away from such abusers. Sarah Gates grew up and lives in a small town in Maine.